Exped DownMats: super comfortable, infinitely warmer and more compact than any other comparable mat of similar weight. Since down compresses so well, Down Mats also packs very small. The integrated pump makes inflation easy. Both low profile valves (pat. pend) one for inflation and the other for deflation ensure ease of use. As the valves are flat and not on the mat�s edge they do not protrude and are therefore protected and durable. 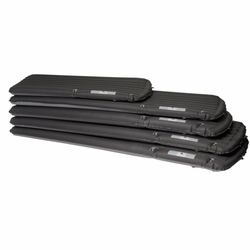 Light foam blocks at the mat�s ends prevent down from escaping or migrating between chambers. Laminated polyester fabric is both durable, airtight and humidity resistant. The shell's top surface is of brushed polyester fabric that provides excellent slip resistance and comfort next to the skin. Dark colors dry quickly. The seams are high frequency welded for durability. Two loops at the head end can be used to secure the packsack to the mat when used as a pillow. Exped only uses IDFL-certified goose down, specially treated to eliminate the effects of humidity that may reach the mat�s interior.